Outsider art. Here’s a little history. The name goes back to the 1920’s and oddly enough has been attributed to psychiatric patients artwork. In 1922, a German doctor named Hans Prinzhorn published a serious study of art created by patients with mental illness. It was called Bildnerei der Geisteskranken (The Artistry of the Insane). For obvious reasons, it got the attention of everyone but particularly the avant garde artists of the time including Franz Marc, Paul Klee, Max Ernst and Jean Dubuffet. They were fascinated by the idea that art was being created in isolation, without any influences from the outside art world, yet it was original, inspired and highly compelling. Raw creativity was finding a way to be expressed. Today we see a different picture. The scope of Outsider Art has expanded and now the definition includes art created by a wide variety of people outside the traditional art world – aka “outsiders,” who make “art” and share a common gift of raw creativity. Today’s Outsiders come from all walks of life and age groups, and represent a wide variety of cultures. In recent years, there may, in fact, be more Outsider Artists than ‘Insider Artists’ who have achieved high praise and validation from the elite art world. A Street Frames has had a robust presence in the Outsider Art world since the 1990s. It was around that time that we framed pieces from many galleries that represented only this genre. Because so many outsider artists work with non-traditional, and often fugitive materials, we have developed a specialty of sorts, creating frames for objects such as these. 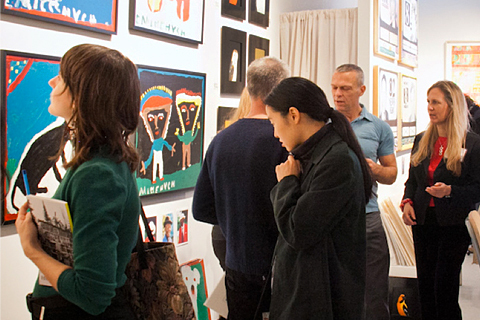 If you happen to be in New York this weekend, don’t miss the opportunity to go the Outsider Art Fair at Center 548.